When you have menstrual cramps, sometimes all you want to do is lie down and hope they go away; most days, you don't have that luxury. If you relax with a hot cup of ginger tea, you might find relief from the herb's healing properties. However, you should talk to your doctor before using ginger as a treatment method. Menstrual cramps are a common symptom of menstruation. This symptom usually starts days before menstruation or at the beginning of it. If you have extreme pain, you might have the condition called dysmenorrhea. Dysmenorrhea can be a sign of problems in your uterus or other pelvic organs, including PMS, endometriosis or ovarian cysts. Talk to your doctor if you have extreme menstrual cramps. 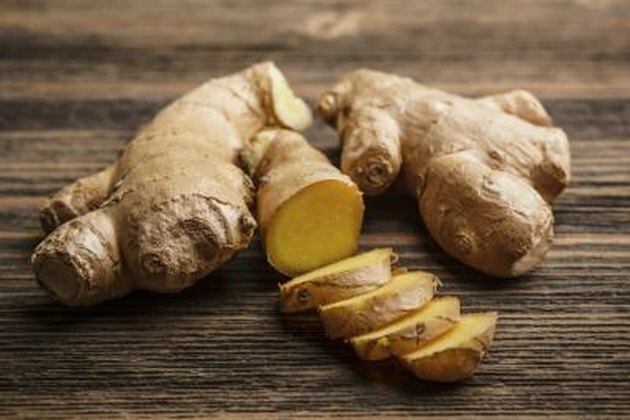 Ginger has been effective in relieving inflammation and pain, and it can help alleviate the pain associated with menstrual cramps. Ginger also is used for nausea and an upset stomach, symptoms that sometimes accompany menstruation. The University of Maryland Medical Center recommends taking ginger two to three times a day while you are experiencing menstrual cramps. Make ginger tea from the root of the ginger plant, which you can find in most supermarkets. Slice pieces of the root, cutting off the skin and discarding it, and then cut the slices into small pieces. 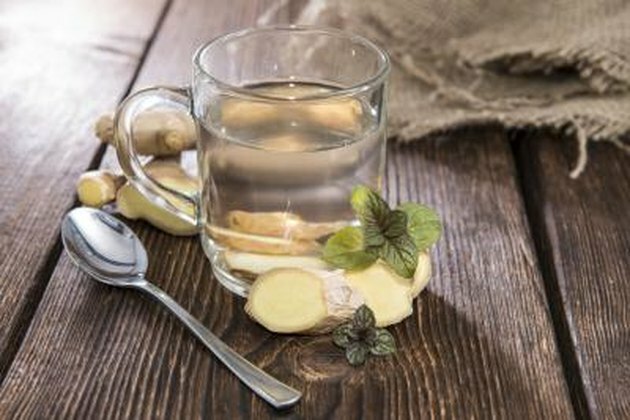 Use 2 tablespoons of ginger root pieces for every cup of water. Add the ginger to the water, bring it to a boil in a small pot and then turn the heat down and simmer it for one hour. Strain the ginger from the water and drink the tea. You also can purchase prepackaged dried ginger teabags and follow the package directions to brew them. Although ginger tea is generally considered safe, it does have a few side effects. Do not drink ginger tea if you have peptic ulcers, as it might worsen them. Using too much ginger might cause mouth irritation, heartburn and diarrhea. Avoid ginger if you have a bleeding disorder or are taking blood-thinning drugs. Talk to your doctor before taking ginger if you have gallstones.